Acyclic diene metathesis (ADMET) polymerization techniques and methodologies developed over the past five years are reviewed. Through constant catalyst development and further understanding of catalytic activity and side reactions, metathesis has solved a number of synthetic problems through the mild carbon-carbon bond-forming reaction. Polymerization of functionalized α,ω-dienes has afforded strictly linear copolymers of ethylene and various polar monomers that are unattainable through chain polymerization methodology. 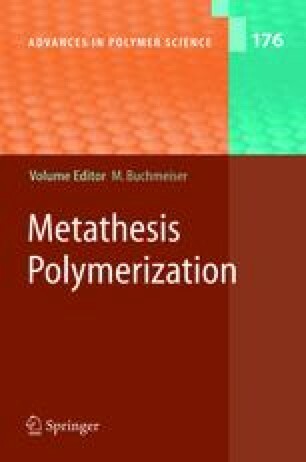 Telechelic preparation via ADMET allows the synthesis of reactive polymers as starting points for block and segmented copolymers. Application of ADMET to materials synthesis has yielded novel amino acid and peptide polymers as well as silicon-based materials.